Pearl re-stringing and cleaning services by mail in the USA since 2008. You can expect to pay $2-4 per inch to an experienced stringer like me who works from a home studio and $4-10 per inch at a jewelry store where the cost of overhead is higher and where they may be sending the work off to be done at another location. 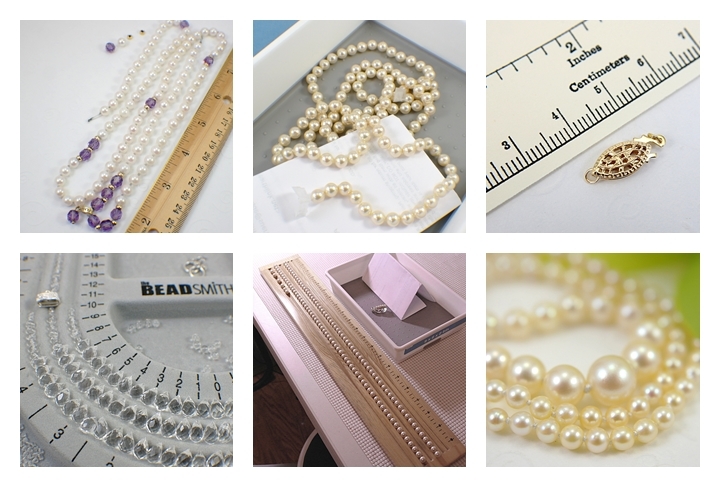 Prices vary depending on the size of the pearls, length of strand, complexity of design, level of difficulty, expertise of the pearl stringer, quality of materials, locality and more. Multi strand pieces are charged per strand. E-mail me the following at sue@suerunyondesigns.com (copy and paste the text below). It is helpful if you include a digital photo of your piece with a ruler in the photo. I do not do quotes over the phone. USA customers only. description and length of strand(s) in inches or cm (measure full length around). The part of the clasp that shows when fastened is figured in the total length. Is the piece knotted between beads? would you like USPS First Class return mail ($3.15) or Priority ($7.50)? 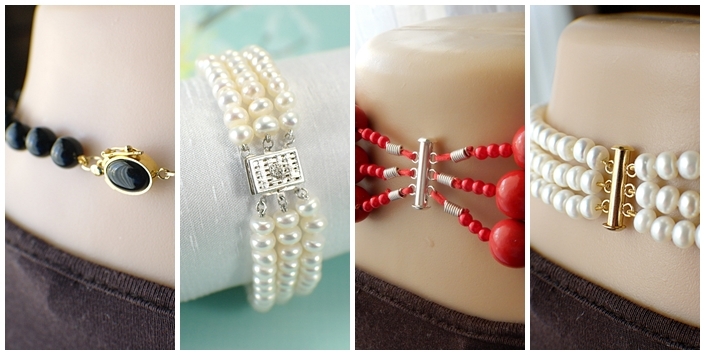 do you need additional services such as pearl cleaning ($12 per strand) or a new clasp? NOTE: Pearls that very much need cleaning must be cleaned before restringing to keep the new stringing material clean. Look at the stringing material under magnification and in good light to see if it looks dirty or if there is any dirt build up around the drill holes. I can also re-string some other beaded jewelry or redesign pieces. I can take two or more pearls off a strand to make matching dangle earrings for customers. 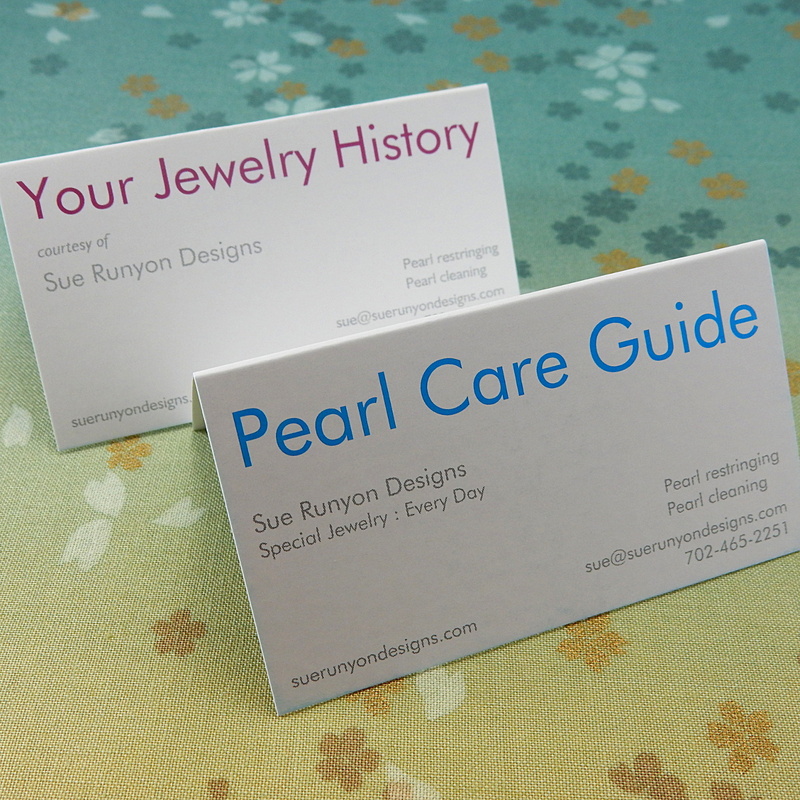 Prices include consultations, quality digital photos for communication, insurance and resale purposes, a pearl care guide and a jewelry history card to keep in your jewelry box. Alabama residents will pay 9.5% sales tax. Payment is due up front. I will e-mail you a PayPal invoice to pay securely on-line. You do not need a PayPal account. Please do not mail items until we have agreed on exactly what I will be doing for you and I have e-mailed an invoice and mailing instructions to you. I do not take checks or money orders. I do not accept pearl restringing projects from outside the United States. Insurance is required and is based on your estimated value of your items. I am not a certified pearl appraiser so you will have to provide this information to me. Your item may be more valuable once it has been repaired. I do not have a retail store or keep regular office hours so there is no drop off and pick up location. Transactions are conducted through the mail and work is done in my pet and smoke free private studio. Graduated strands can take a lot more time and extra materials to string and therefore may cost more. Different sized beads can have different sized holes so extra threads may need to be woven in to make the knots large enough to not pull through the bead holes. I will not be able to tell if a graduated strand will require special stringing techniques until I have examined it in person. Weaving costs range from $14-$40 additional per strand. Wholesale: I do restringing for jewelry stores and people who purchase estate jewelry, but do not offer wholesale pricing on pearl stringing. 1. When your jewelry arrives I will e-mail you a photo as proof of receipt. 2. Your items are placed in a job tray with your information. 3-4. You may receive photos of components or layouts to approve. 5. Pearls set out and ready to string. 6. I will e-mail photos of your completed piece before returning it by insured mail. You must contact me to make arrangements for sending me your pearls to re-string. You must contact me via e-mail so that I have a good record of our correspondence to look back at. I will email you a PayPal invoice to pay securely online. The invoice will include my shipping address and mailing instructions. You may use the quality photos of your item you receive from me for your insurance inventory purposes or for resale and advertising purposes if you are selling the pieces once they are repaired. I will usually send one photo with a ruler in it to show scale and a pretty shot and detail shot. If you share the item photos with friends on social media, I ask that you link to this page. You will receive an automated message through your payment e-mail address which contains a tracking number for your package when it is returned. All packages insured for $300 or more are required to be signed for by the USPS. If you are not present when delivery is attempted you may have to pick it up at your local post office. There are various ways to string pearls. I usually use the traditional method of hand-knotting on a double strand of strong silk thread (usually white, black or grey depending on pearl color though I do have a few other colors). Most sizes of pearls are knotted between each pearl so that the strand has a beautiful drape, the pearls do not rub together, and so that if it ever were to break you would only have a pearl or two fall off the strand. Silk thread is traditional. If pearls are small, they are generally knotted between sets instead of each pearl to keep them from looking too skimpy. If other beads are used with pearls, such as jade or gold beads, they are also often knotted between sets. If the pearls are interspersed with gemstone or metal beads, I will often use a strong bead cord to knot them instead of silk. This insures that the sharper edges of the gemstone or metal beads will not cut through the stringing material with wear. Bead cord is also the best choice for long and heavy strands. I use a double strand of braided 10-50lb test (depending on the size of the drill holes) nylon bead cord that is coated and very closely resembles silk. Bead cord also resists dirt and oil build-up that can leave the knots looking tired over time. Pearls strung on silk, and which are worn frequently, should be re-strung once every 1-3 years. Silk is a natural material which will stretch and degrade over time. 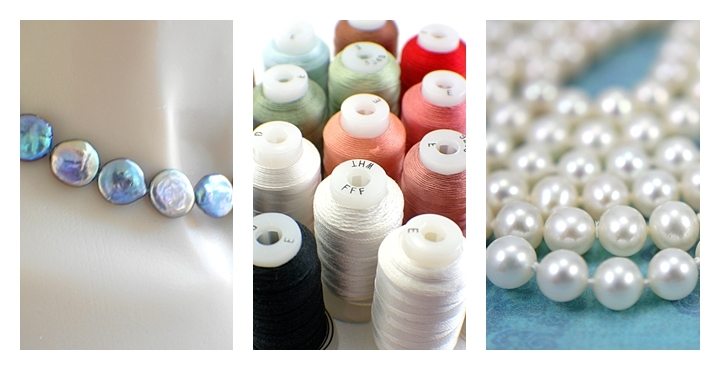 You can usually tell if your pearls need to be re-strung if the silk is dirty or if the pearls slide between the knots. They should also be re-strung if they've been stored and not worn for a long time. Pearls strung on bead cord should only have to be re-strung if the the bead cord has been stretched by frequent wear over time and the pearls are no longer tight against the knots. When I string, I pre-stretch the bead cord so this is unlikely to happen unless the beads are very heavy or if the wearer tends to pull on them during wear (I admit that I tend to pull on my pearls, but it's so hard to resist touching them). Because most stringing materials stretch over time, I knot everything just a little tight so they may appear slightly kinked at first. The weight of the strand and the heat and moisture from your body while wearing them will stretch the strand after a few uses. If they aren't strung slightly tight at first, the pearls will have room to slide between knots which does not look good and can cause wear. I sometimes get requests to use small knots between the pearls. Knot size is determined solely by the size of the drill hole. I do tighten the knots down as much as possible. On most pearl strands there are slight variations in size, quality and luster. When I re-string I pick the biggest and best pearls from your strand to go front and center and the smallest to go near the clasp. This makes the clasp a little easier to fasten and the slight graduation makes for a visually graceful strand. If you have a higher quality strand this will probably already have been done and I will therefore keep all your pearls in the same order. If it has not been done I will do it for you unless you specify otherwise. On long or continuous strands slightly different sized pearls are alternated. The weakest point of any bracelet or necklace is the point where the clasp attaches to the strand. Because of this, I spend extra time covering the stringing material with the tiniest coiled wire which is called gimp, bouillon or French wire. This prevents the metal of the clasp from rubbing against the stringing material and makes the attachment much more durable. This step is generally skipped by most pearl stringers resulting in a weakened attachment. I also spend a great deal of time weaving the ends of the stringing material back through the holes of the last three pearls on each end so that it will never unravel or come undone. Since most pearls are now strung on bead cord, most pearl stringers just tie the ends to the clasp and melt it on by holding the ends briefly under a cigarette lighter. Sometimes they will glue it or knot the end and clamp it to the clasp with a crimp bead or bead tip. All of these methods will work OK for a while if done correctly, but are not as secure over time as the classic methods that I use. Occasionally I'll run across pearls that have had the stringing material glued through them. Sadly, this often makes the pearls near the clasp unusable for re-stringing if the glue is not water soluble. Many fine jewelry stores who re-string pearls on silk will attach clasps by using bead tips/clamps at the end of the strand instead of using french wire and weaving back through the last three pearls. This is done because very few jewelry stores have anyone on staff with the skill or patience for fine pearl stringing. Metal edges on the bead tips will cut into the silk over time. When re-stringing a piece that has bead clamps I remove them and weave the ends back through. This may shorten the strand by a few mm. I stock a small collection of clasps, but other types can be special ordered. My turn around time is usually 1-2 weeks, but can be longer at busy times and for long, complex, graduated or multi-strand pieces. Bridal season, Christmas and when I'm on vacation, times can be a little longer. I'm often asked how long it takes me to string pearls. If all goes smoothly, the approximate time it takes me to string a 16-18 inch strand of 6-7mm pearls on silk is about an hour. Time will vary depending on the size of the pearls as well as the length of the strand. Much of the time is taken up in attaching the clasp properly, therefore a bracelet takes nearly as much time as a necklace. All too often, things don't go smoothly as weaving back through the very tiny holes in pearls that already have a double strand of stringing material in them can be nearly impossible and may require starting over. I've been to China and have watched girls string pearls at the speed of lightening and sometimes people expect that of me. I just have to say they don't use the same methods. They usually take the ends of the temporary strand and knot a single strand of bead cord to it and fish it through, then finger tie knots without stopping to tighten them, and use the cigarette lighter method to melt the cord to the clasp. Often this works well, but sometimes it doesn't. I've seen a lot of very badly strung pearls. I've also seen a lot of nice pearls that have been strung without any knots or with the wrong gauge of silk thread or bead cord. 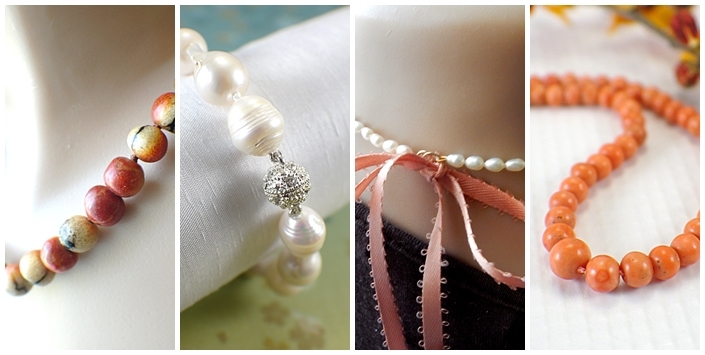 I sometimes see pearls strung on cotton thread or sewing thread which degrades quickly. Classic pearl stringing is an art that takes a lot of practice and requires having a good selection of stringing materials on hand to be ready for each situation. Shortening offers the opportunity to either get rid of a few flawed pearls or to remove some to use to make drop earrings or a pendant. I'm often asked to "just take a few pearls off the end instead of re-stringing." Unfortunately, this can rarely be done with the traditional methods that I use. The entire piece must be re-strung because the ends must be woven back through the last few pearls or beads. Lengthening can be done if pearls were never knotted. Adding knots adds some length--generally an inch or two on a necklace. Strands can also be lengthened with an extender chain, by adding some smaller pearls near the clasp or by mixing in other types of beads. Because of the width measurement of just one pearl or bead, exact lengths may not always be achieved. Your piece may be a few mm shorter or longer. For instance, something sold as a "16 inch" necklace may be a few mm shorter or longer than 16 inches, but it is within the accepted range of what is considered to be 16 inches. If this will make a difference in terms of fit for a snug bracelet or choker, please let me know if going longer or shorter is preferred. Often it is a good idea to clean your pearls right before re-stringing them. This is usually done while they are still on the old stringing material, but not always. Look at the stringing material under magnification in good light to see if it looks dirty or if there is any dirt build up around the drill holes. There's really no magic or skill involved in cleaning the pearls except for careful handling and keeping them far away from the drain! I use a gentle natural liquid soap (not a detergent) with no dyes or perfumes in it and a lot of clean, room temperature water in a bowl away from the sink. I carefully clean them by hand without rubbing the pearls together. I use a soft baby washcloth on them. Then they are rinsed several times in bowls of clean water and patted dry with a soft cloth. The pearls are then carefully cut off the old stringing material, without scratching the pearls, and allowed to dry for a day or two in order to make sure all water evaporates out of the drill holes before re-stringing. You will have to give me an estimate of the value of your pearls so I can give you a quote on return insured shipping. I am not an appraiser so I cannot give you a value on your pearls. I will also need to know the approximate size in mm of your pearls and the length of your strand. Strands are measured along the entire length of each strand from one end of the clasp to the other or around the entire loop of a continuous strand. Note that if the pearls on your strand are sliding between the knots it will be returned to you knotted tightly and will therefore be shorter than before. It is a good idea to count the number of pearls on your strand before sending them. Let me know any other details such as if you want some pearls removed for me to make earrings or a pendant with, you need a new clasp or if you want your strand re-strung on silk or bead cord. When you are given or inherit pearls you may not know if they are genuine or not. Unsure about your pearls? View my Pearls Real or Fake guide. I'm not a pearl appraiser and I'm perfectly happy to re-string simulated pearls for you, but some people decide it's not worth it if they are not real. Other people decide it's a good opportunity to do something more modern with the simulated pearls and have me add other beads to make a new custom design. There are no refunds on pearl or bead re-stringing or repair services. If you are unhappy for any reason, you may return the item to me to be re-strung one time within two weeks of receipt. Obtain return authorization by phone or e-mail before sending so I know to expect your return. Unless you tell me otherwise, I may use photos of your item and/or your feedback on my website, blog, facebook page or other social media to show others examples of work that I have done. I use customers' first names and state or country to identify their quotes unless I have specific permission to use other information from a customer. I do not sell or give customer contact information to anyone. Your privacy is important to me. I'm not a jeweler so I can't fix some things, set stones or drill pearls, but I can do many different types of repairs, changes or sizing adjustments on beaded jewelry. One common request I get is to change a clasp to a magnetic one for someone who has a hard time fastening a traditional clasp. I really enjoy making broken strands whole again. © 2016 Sue Runyon Designs. All rights reserved.